Upright: Heartbreak, emotional pain, sorrow, grief, hurt. Reversed: Negative self-talk, releasing pain, optimism, forgiveness. 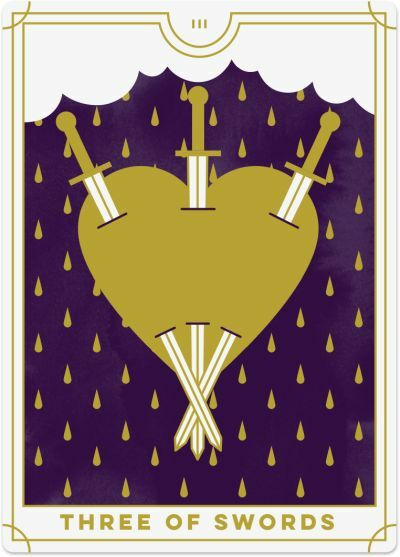 The Three of Swords shows a heart pierced by three swords, representing the pain inflicted by words, actions and intent on the emotional and physical self. The dark clouds gathering in the background mirror this pain but offer the hope that, just as the storm clouds will disappear, so too will the pain and hurt you are experiencing. When the Three of Swords turns up in a Tarot reading, it signals that you are feeling deeply hurt and disappointed. Your heart has been pierced by the sharp blades of others’ hurtful words, actions and intentions, and they have inflicted intense emotions of pain, sadness, grief, and heartbreak. These events are often unexpected and come out of the blue, making them even more painful. The Three of Swords is also about an emotional release. When you have suffered a major setback or loss, now is an excellent time to have a good cry. Expressing your sadness is part of the cleansing process and letting it all out will help you move on to better times. Allow yourself the opportunity to experience these emotions, no matter how painful. Cry, shout, or scream at the top of your lungs. Do whatever it takes to express your anger or pain as this will help the emotions flow through (and out of) you. However, it is also essential that you continue to focus on the path ahead. You may run the risk of becoming so absorbed in the emotions swirling around you that you lose sight of the need to just let go and move on. Your focus stays locked on the damage when it should be on the recovery. Now is time to accept what happened and move forward with your life. The Three of Swords comes as a reminder that pain, sorrow and grief are a necessary part of life. Without pain, you would never experience the challenges you need to grow and develop as a person. Every hardship creates discomfort, which inevitably turns into an opportunity to become stronger, learn from your mistakes, and change the course of your life for the better. While the pain may cloud your vision for a time, it will eventually bring clarity and enable you to put the past behind you. Can you see this experience as a learning opportunity? The good news is that this painful season will pass. While the Three of Swords brings hurt and sadness, it is only temporary. You will bounce back. The clouds will dissipate, and soon you will have a better perspective on what you can learn from the experience. You can conquer any pain that comes your way – all it takes is faith, self-love, forgiveness and time. The Three of Swords often arrives when you are taking others’ words to heart. You may be more prone to internet trolls, workplace bullies or spiteful strangers. Or it may be closer to home, with those you love saying hurtful words to you – just remember that you do not have to accept their words as truth; they are merely another person’s opinion or a projection of their own inner fears and anxieties. Shift the energy by looking at these people with a compassionate heart: what struggles are they going through that they feel they need to throw their insecurities at you? Be mindful, too: why are their words triggering you? Is there a more profound truth in what they've said, one you might not be willing to see just yet? Use these pain points to expand your perspective and see the bigger picture of what is happening here. 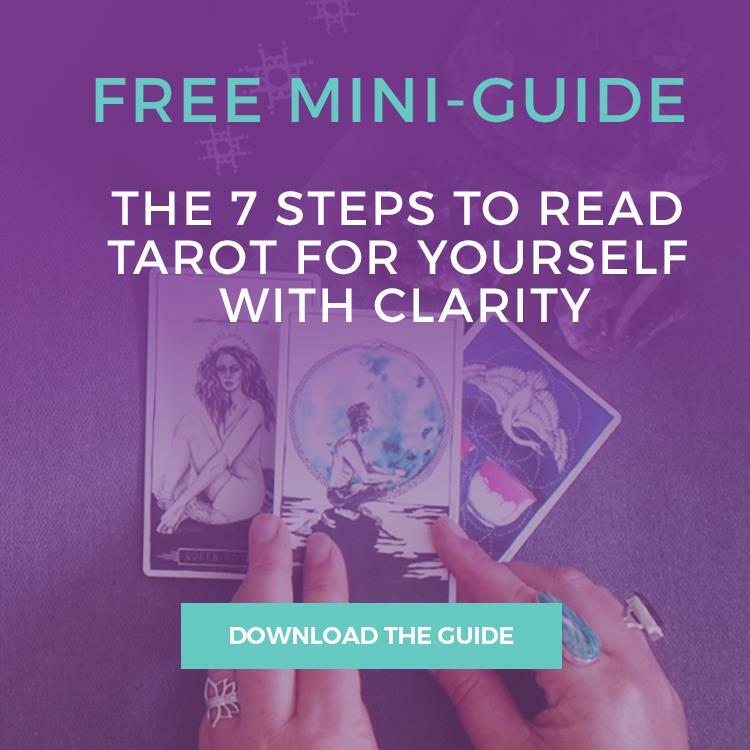 The Three of Swords reversed encourages you to pay attention to your inner thoughts and self-talk. Your words are powerful, especially those you repeat to yourself day after day. You may be prone to self-criticism, limiting beliefs and negative self-talk. You may identify with an ‘inner mean girl’ (or boy) who is constantly telling you why you’re not good enough. When you hear these negative thoughts come up, ask yourself whether you would ever utter these words to a friend or loved one and if the answer is a 'hell no', then why are you speaking these words to yourself? Look at how you can shift your thoughts towards the positive to reinforce your confidence. You have what it takes to be the person you deserve to be. You may also be hypersensitive to others’ words and need to develop a thick skin. Let go of the hurt that these words are causing you – it will only hold you back – and do some self-reflection. What has triggered your feelings and why? And how might you address the underlying issue? For example, if you are upset by a friend’s accusation that you are selfish, look within yourself to see where you may be acting selfishly. If this behaviour is no longer serving you, then let it go. The Three of Swords reversed can indicate that you have recently gone through a difficult patch in which a relationship has ended or been challenged, a loved one has passed, or you were hurt by a situation that affected you deeply. Thankfully, the reversal of this card suggests that this time has passed, and you are on the path to recovery, realising that with every cloud comes a silver lining and you have other things in your life which bring you joy. You have reached a point where you can accept the pain and are ready to move forward. If you are experiencing challenges in your relationships, the reversed Three of Swords serves as a reminder to be the peacemaker. Always think before you speak, so you will not later regret what you have said. And never be afraid to say you are sorry.